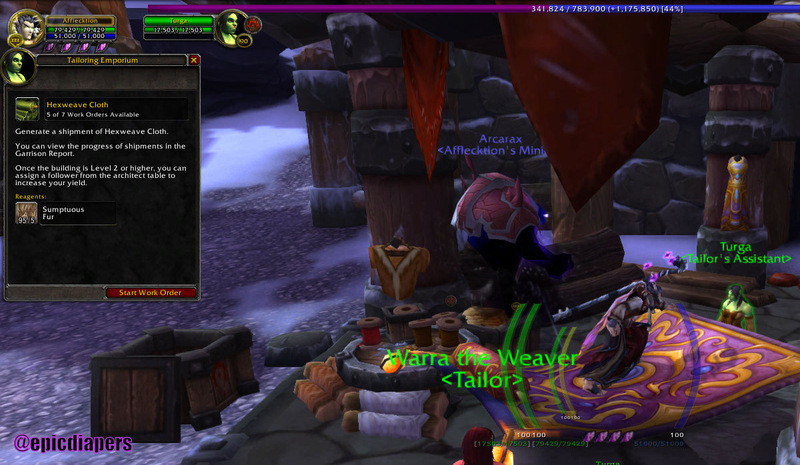 My level 91 lock in his tailoring emporium, putting in orders and crafting ilevel 640 equipment. If you’re an altoholic like me, or you plan on leveling several toons to 100, I’ve got a few tips for you that can make your overall leveling process faster, and a way to manufacture more materials and gear for all of your toons. If you have several toons at level 90 gathering dust, may I suggest leveling each one of them until they establish their garrison. Typically, this takes only an hour or so to do, but once that garrison is built, resources start accumulating at about 500 every 3 ½ days. Now, you can simply log in every 3 days to collect your resources, and when you’re ready to take that toon to 100, you’ll be swimming in resources which will enable you to send more followers on missions, construct buildings faster, and even buy that 20% experience buff potion from your garrison innkeeper to save hours of leveling. If you have an extra hour or two to spend with each alt that has established their garrison, may I recommend that you select a crafting profession and complete that initial questline in frostfire ridge to get the level 1 blueprint. Now, you can build your tailoring emporium, forge, or whatever you need mats for. My level 91 warlock has already created enough hexweave cloth for a level 640 chest, and I plan on creating the legs and helm to wear to make his eventual leveling process even faster. My lock also has 4 followers, all at level 100. Often the player experience quests come up, and I’ve gained almost a full level on my lock by just completing those missions with the experience potion buff active. All 25 of my followers are level 645 or higher now. What to do with all the 615 gear? I am a filthy casual player, yet I have 23 followers over ilevel 645, and the other two are at 630, and all 25 are epic. Yet, I continually hear from players that are frustrated about their low chances at higher level missions such as the Highmaul raid for ilevel 655 gear because of few followers at level 645 and the rest are barely off the mat from 600. Look, I log in only once or twice a day to do missions management, but aside from the addons of Garrison Mission Manager and Master Plan as a great aid, I am obtaining virtually all of my follower enhancements from big crates of salvage and the War Mill. 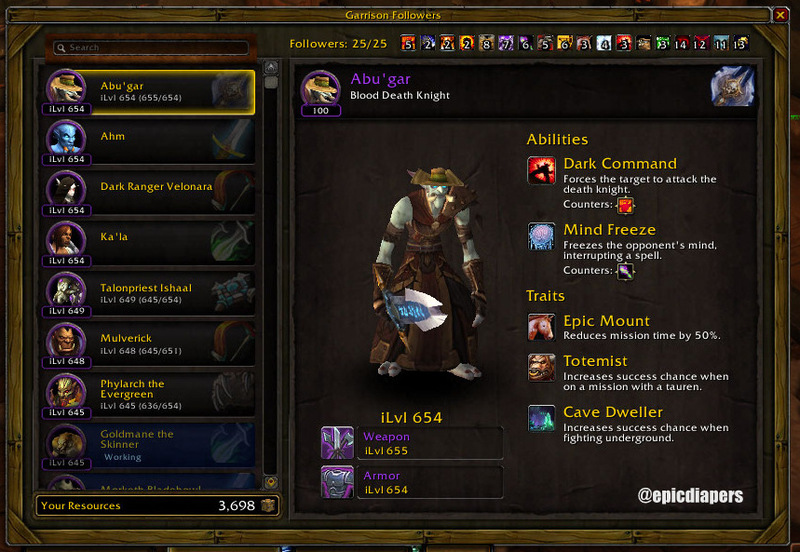 If follower levels are important to you, you need to put in a salvage yard and war mill and upgrade them to level 3. For every level 100 mission you complete, you get a big crate of salvage, and the war mill processes garrison resources for metal scraps and follower enhancement items. In patch 6.1, you will also be able to access a daily quest to trade in your iron horde scraps, or the alliance equivalent, for follower equipment. I do raid Highmaul with my raid team, yet I have some great gear from missions that I can easily complete due to my army of high level epic followers. Download the segment here, or stream it below! That’s right peeps. I’m talking cold sweet gold baby. 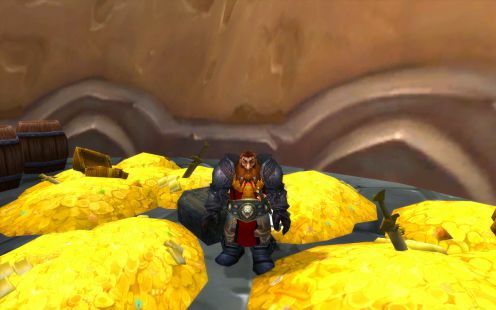 You could make it by flipping junk on the auction house or finishing all those quests that other NPCs are telling you to do, or maybe even by shaking that thing on top of the mailbox, but I’m talking quick gold with some satisfaction, if you know what I’m throwin’ down. I’m talking about wiping up those old raids, baby. That’s right, I flew my dew-glistening body over to the Bastion of Twilight and farmed that first room over and over and over again until I couldn’t take it anymore, but 10 times in an hour ain’t nothing to shake a stick at..
And you know how much I made? 2,000 gold in 15 minutes. That’s 8k per hour, and you could even make more, considering your luck. Besides the cash and trash, you can take all of that embersilk and make some sweet high-thread count silk sheets for other endeavors, or make bags that sell like hotcakes at around 400 gold a pop. That, with some of the transmog epic gear and you’re well on your way to making enough of that coin to buy whatever you want. Reality is that I did make a lot of gold farming BoT, and it provided a quick boost in cash to my reserves. Of course, after I farmed this, an ilevel 665 trinket dropped from a salvage crate that I sold for 40,000 gold, so that kind of outstripped gold/hour of any farming I’ve done! You can listen to this audio segment by downloading here or stream it below! Don’t forget to follow me @epicdiapers! MY LEVEL OF OCD HAS QUADRUPLED! You can download the audio segment here, or stream it below! Hey everybody, it’s Sihx, back with another load of Epic Diapers. Alright, so we all have a problem. We can’t quit it. It consumes almost every hour of every day. But, the first step to a clear concious is admitting the addiction. We obsess over garrison missions. We need to find out if that mission with a 76% chance to get a level 630 weapon was successful, or how many crates of salvage are back, or if that blue level 100 follower turned purple yet. Well, there are tools out there to feed your addiction, feed that burning desire to send more followers out, yet still have enough resources to upgrade your salvage yard to level 3. They are addons. The first is “Garrison Mission Manager,” and these programming devils have made assigning missions so much easier. Each mission also has three choices of teams that you can send on their happy way to balance out your follower talents and make sure you have as many successful missions go out as you can. The next soulless addon is called “Master Plan.” With this tool of you can sort missions by chance of success, level, or rewards. 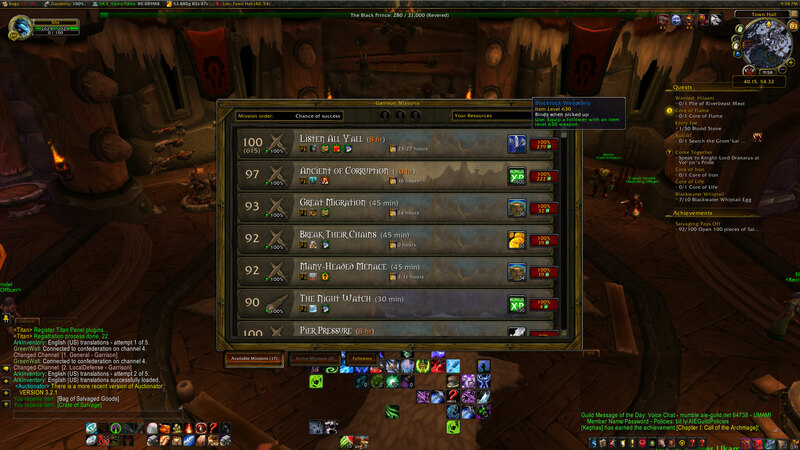 The garrison missions window is also split into separate available or active tabs so you can see which teams are out in Draenor trying to make the boss (that’s you) happy. So, even though these addons make your garrison mission managing more efficient and hypothetically save you time, it won’t because you’ll be doing so many more missions that your level of OCD will increase exponentially. I found additional buildings to choose for your Garrison in my special pre-alpha-beta-eta-theta-beta access to WoD. Although we’re still months away from the new expansion dropping, we have gotten a sneak peak on many of the new features coming our way. Recently, Blizzard gave us a little more information on the new Garrison feature, where we’ll be able to build our own little buildings in various zones. I have exciting news though, Blizzard has given me special pre-Alpha Beta Gamma Zeta Eta Theta pre-pre-Omega access to the expansion, specifically to test out this new Garrison feature. You can follow me @epicdiapers. I also co-host TortureCast with Willie Dills and Kids Are Hard with my wife, so be sure to check those out. And, for you science geeks out there, I’ll be a special guest on This Week in Science with Dr. Kiki Sanford on June 12, so look for that soon!